Dr. Elham Manea's Acceptance Speech in full as Raif Badawi was awarded the prestigious Geneva Summit Courage Award on 24th February 2015. We stand united in our humanity. Your precious courage prize, which I gratefully and cordially accept on behalf of Raif Badawi, is telling us just that. You do not know how much this prize means to this fight for freedom, or to those men and women who are standing for their basic human rights in the face of tyranny and human rights violations. Your prize tells us that we are not divided by culture, religion, race, gender, or color. No. It tells us that we stand united in our humanity; united in our unequivocal commitment to and defence of universal human rights. It tells these brave men and women that they do not stand alone in their fight for their basic human rights. They do not stand-alone. For we stand together. Raif Badawi belongs to this category of brave activists. In fact, I consider him one of the bravest. When a judge told him that he should repent and apologize, for what the judge called 'his crimes' -- or face consequences, Raif calmly responded: I did not commit a crime to repent or to apologize for. The consequence the judge meant at the time was the death penalty for apostasy. But he said: I did not commit a crime to repent or to apologize for. It was a simple but fateful sentence. One made of pure belief in his and his fellow citizens' right to freedom of expression, opinion and belief. These are not abstract ideas we talk about in closed conference rooms. Their absence in a society turns the lives of citizens into a living hell. And Raif understood this, he also understood something that we sometimes tend to forget: what he is fighting for is a right -- a basic universal right we are entitled to -- it is not a gift or a grant that the state can give or withhold as it wishes. Because of that Raif Badawi is a symbol -- a symbol for all those imprisoned in the Kingdom of Saudi Arabia and the MENA region because they dared to express their opinion, to exercise their right to freedom of thought, religion, and political association; and a symbol for all those demanding their basic human rights peacefully. He stands for Waleed Abulkhair, his lawyer, sentenced to 15 years in prison for doing nothing but his job and demanding political reform. He stands for Mohamed Rashid al-Ajami, a poet, sentenced in Qatar for 15 years for writing a poem. He stands for Shaimaa Al Sabagh, who was shot in her back in Egypt while protesting peacefully. HE stands for all of them. We meet here today across the street from the United Nations Human Rights Council. Saudi Arabia was elected last year to this council and it pledged to live up to the highest standards of human rights. I respectfully wish to ask: Why does the Saudi government deny freedoms of speech, religion and political association to it citizens? As a member of the UN Human Rights Council, why does Saudi Arabia imprison a young man who committed no crime, who only created a blog calling for freedom? Why does it flog a young man with 50 lashes for expressing an opinion? And as a member of the UN Human Rights Council, why does the Saudi government impose a system of gender apartheid on its female citizens? Perhaps it is therefore a chance; this membership. For it is time the Kingdom live up to its promise, as a member of the UN Human Rights Council, to respect universal human rights. I respectfully take this opportunity to call on his majesty King Salman to free Raif Badawi and unite him with his family. 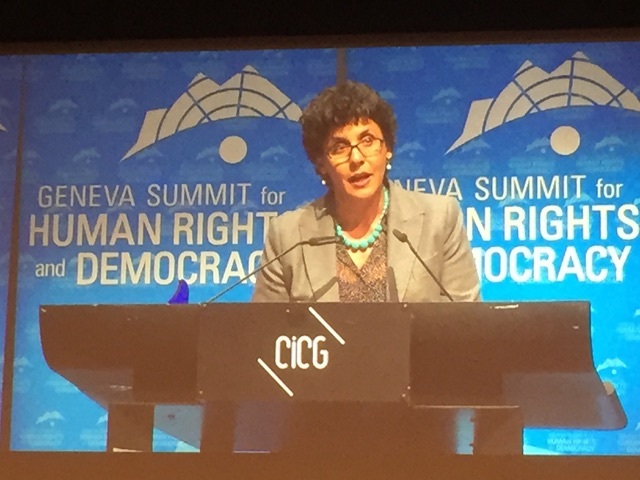 Thank you, Geneva Summit, for your outstanding contribution to the universal fight for freedom.